1. NO PURCHASE NECESSARY TO ENTER OR WIN. A PURCHASE WILL NOT IMPROVE YOUR CHANCES OF WINNING. This TicketsatWork: Win a Trip to Universal Orlando Resort Sweepstakes (the “Sweepstakes”) is only open to legal residents of the 48 contiguous United States (excluding Hawaii and Alaska) and the District of Columbia, who are 18 years of age or older, except employees of TicketsAtWork – Plum Benefits, LLC d/b/a TicketsatWork (“TicketsatWork”) and Universal Orlando Resort, and each of their respective parents, subsidiaries, affiliates, franchisees, advertising and promotion agencies, affiliated entities, each of their respective employees, officers, directors and agents, and the immediate family members (parent, child, spouse, sibling, and their respective spouses, regardless of where they reside) and household members, whether or not related, of each of the foregoing (the “Eligible Participants”). This Sweepstakes shall be void wherever prohibited or restricted by law. This Sweepstakes is subject to all applicable federal, state and local laws and regulations, and shall be governed by the laws of the State of Florida. By entering the Sweepstakes, entrants: (a) agree to accept and be bound by all terms of these Official Rules and the decisions of TicketsatWork, which are final and binding, (b) agree that Orange County, Florida courts have jurisdiction over any dispute or litigation arising from or relating to the Sweepstakes, and (c) that venue shall only be proper in Orange County, Florida. 2. HOW TO ENTER. Beginning on Sunday, June 17, 2018, through Tuesday, June 19, 2018 (the “Sweepstakes Period”), TicketsatWork will conduct this Sweepstakes. Eligible Participants may enter this Sweepstakes by having their badges scanned at the TicketsAtWork booth at the SHRM conference. Entries which fail to meet any of the above requirements shall be voidable in TicketsatWork’s sole and absolute discretion. All entries received other than within the Sweepstakes Period will be disqualified without exception, including any delay caused by malfunction of any email transmission or internet facilities or mail delivery delay causing late receipt by TicketsatWork. Each Entry must be submitted in the name of an individual person and a prize will be awarded to the person whose name is on the winning Entry. There shall be a limit of one Entry per individual. All Entries received from any individual in excess of the stated limitation shall be voidable at TicketsatWork’s sole and absolute discretion. No mechanical reproductions, mailed Entries, facsimiles, mass Entries, Entries generated by a script or macro, or Entries that subvert the entry process will be accepted, and all such Entries will be deemed void. Released Parties (as defined in Section 5 below) are not responsible for misdirected, inaccurate, incomplete, lost, late, stolen, delayed, undelivered, damaged or garbled Entries, and all such Entries will be deemed void. Released Parties are also not responsible for lost, interrupted or unavailable network, server, Internet Service Provider (ISP), website, or other connections, availability, accessibility or miscommunications, or failed computer, satellite, telephone or cable transmissions, lines, or other technical failure, or jumbled, scrambled, delayed, or misdirected transmissions, or technical, hardware, or software failures of any kind, whether computer, network, technical, mechanical, electronic, printing, typographical, human or otherwise, including, without limitation, errors or problems which may occur in connection with the administration of the Sweepstakes, the processing of Entries, the announcement of the Prize, or in any Sweepstakes-related materials. TicketsatWork reserves the right, in its sole discretion, to cancel this Sweepstakes should any computer virus, malfunction, fraud, tampering, unauthorized intervention or other cause corrupt the administration, security or proper operation of website(s) or other hardware or software dedicated to this Sweepstakes, and no extension or modification to the Sweepstakes Period will be provided in any such instance. In the event of cancellation, TicketsatWork reserves the right, but shall be under no obligation, to select the winner(s) for the drawing(s) at issue in a random drawing from among all eligible, non-suspect Entries received up to the time of such cancellation. False or deceptive Entries, Entries or acts which, or Eligible Participants who, violate the terms of these Official Rules, will render the participant ineligible. TicketsatWork reserves the right to disqualify any participant who attempts to undermine the legitimate operation of the Sweepstakes by tampering with any Sweepstakes entry process mechanism, by acting in a disruptive manner, by cheating, by harassing other participants, or by violating these Official Rules. Any attempt by an individual to deliberately damage any website or the Sweepstakes entry process, or to undermine the legitimate operation of the Sweepstakes, may be in violation of criminal and civil laws. Should such an attempt be made, TicketsatWork reserves the right to seek remedies and damages (including attorneys’ fees and court costs) from any such participant to the fullest extent of the law, including criminal prosecution. 3. DRAWINGS & NOTIFICATION: One winner (and, if verified, [each] a “Winner”) will be randomly selected at the end of each day during the Sweepstakes Period, from all eligible Entries received throughout the Sweepstakes Period. The decisions of TicketsatWork will be final and binding on all participants in all matters related to this Sweepstakes. 4. WINNER NOTIFICATION: Each potential winner will be notified by TicketsatWork within one week of the date of drawing. The potential winner must reply within 24 hours of date of notification as directed by TicketsatWork, confirming they can accept the Prize, or an alternate winner may be selected. TicketsatWork will not be obligated to make every attempt by every method to contact the potential winner. Noncompliance, refusal, or return of any Prize notification as undeliverable, by automated means or otherwise, will result in disqualification. The potential winner will be required to fulfill all requirements outlined in Section 5 below. Prize awards are subject to verification of eligibility and compliance with these Official Rules. Upon confirmation of the Winner an official public announcement will be made. Anyone may obtain the name of the Winner by sending a self-addressed envelope with proper postage affixed with a postmark dated between the Sweepstakes Period, to TicketsAtWork – Plum Benefits, LLC, 19495 Biscayne Blvd., Ste. 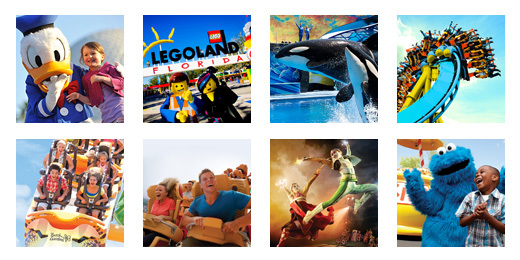 300, Aventura, FL 33180, Attn: TicketsatWork: Win a Trip to Universal Orlando Resort Sweepstakes. 5. PRIZE: Each Winner will receive round-trip airfare for two from any United States location, and two Universal 4-Day, 3-Night Create Your Own Vacation Packages (collectively, the “Prize”). The approximate retail value of the Prize will vary depending on travel dates and point of origin, but in any event shall not be greater than $5,000.00. Trip must be taken before June 19, 2019. 3-Night Hotel Accommodations at one of the Universal Orlando Resorts (to be chosen by TicketsatWork). 3-Park 3-Day Park-to-Park Ticket to Universal Studios Florida™, Universal’s Islands of Adventure™ AND Universal’s Volcano Bay™. Early Park Admission to The Wizarding World of Harry Potter™ and Universal’s Volcano Bay™ one hour before the park opens. Trip must be taken before June 19, 2019. ANY OTHER TRANSPORTATION WILL NOT BE INCLUDED IN THE PRIZE, AND MUST BE ARRANGED AT WINNER’S SOLE COST AND EXPENSE. No substitutions, transfer of prizes or cash redemptions are permitted by Winner. Any attempt to transfer or refund the Prize, in whole or in part, for cash or otherwise, will deem the Prize void and forfeited. Any cost or expense associated with rescheduling travel, lodging, or the entertainment itinerary shall be borne entirely and solely by Winner. Any difference between stated value and actual value will not be awarded. TicketsatWork reserves the right to substitute a prize (or portion thereof) with one of comparable or greater value. Winner is solely responsible for all expenses associated with the Prize acceptance, and any other expenses relating to the Prize, including ground transportation and meals. The Winner is solely responsible for the reporting and payment of all federal, state and local taxes incurred by acceptance and use of the Prize (or any portion thereof), if applicable. The Prize is awarded “as is” with no warranty or guarantee, either express or implied by TicketsatWork. All other Prize details are at TicketsatWork’s discretion. The Winner may be asked to share details of their trip through the TicketsatWork social media, however, winning is not contingent on sharing any details of the experience. In order to claim the prize, Winner must meet all eligibility requirements, and must execute and return certain documents provided by TicketsatWork, or its Sponsors (as may be applicable), which may include an affidavit of eligibility, IRS Form W-9, tax acknowledgment form, liability release and, except where prohibited by law, a publicity release. Winner may be required to produce proof of identity, address and birth date in a form acceptable by TicketsatWork. Such documents must be completed in full and returned within five business days of date of issuance either via email or US registered mail, as further requested and instructed by TicketsatWork. Failure to do so or if (i) any prize or prize notification is returned as undeliverable or TicketsatWork is unable to contact a potential winner within a reasonable time period, (ii) a potential winner declines his or her prize, or (iii) a potential winner is determined to be ineligible or non-compliant with these Official Rules for any reason, will result in disqualification of such potential winner and an alternate winner may, but need not, be selected from among all remaining eligible Entries, at TicketsatWork’s sole and absolute discretion. In the event an alternate winner cannot be determined the Prize will not be awarded. 7. OFFICIAL RULES REQUEST: For a copy of the Official Rules, send a self-addressed, stamped envelope to the following address during the Sweepstakes Period: TicketsAtWork – Plum Benefits, LLC, 19495 Biscayne Blvd., Ste. 300, Aventura, FL 33180, Attn: TicketsatWork: Win a Trip to Universal Orlando Resort Sweepstakes. Requests received after the Sweepstakes Period will not be honored. Vermont residents may omit return postage on Official Rules requests. 8. DISCLAIMER: This promotional Sweepstakes is in no way sponsored, endorsed, or administered by, or associated with Twitter®, Facebook® or Instagram®. 9. SPONSOR: Universal Orlando Resort.